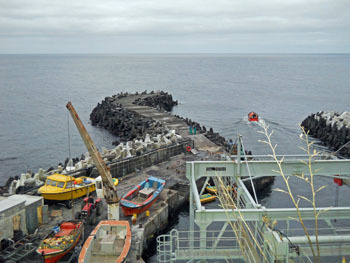 News of commercial and domestic fishing in the waters of the Tristan da Cunha archipelago during the 2014-2015 fishing season. Erik did a spot of line fishing from Calshot Harbour and afterwards on the beach west of the harbour after work on 26th March 2015. 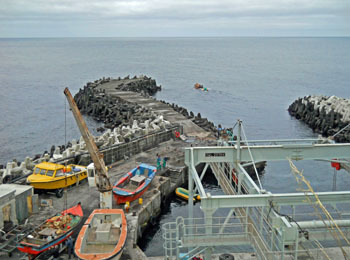 As a result he caught 76 squid, some by line from the harbour and others left stranded by retreating waves on the beach. 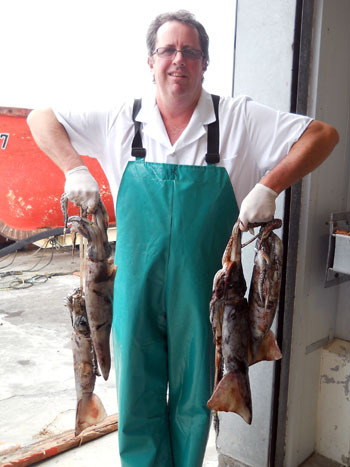 It is only the second time that Erik has managed to catch squid with fishing gear - normally they are only found washed up in the morning - mainly by Roy Rogers who often combs the local beaches. 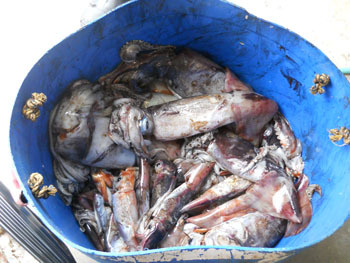 The largest squid was just over 3 kg, and really good eating, but those found washed up dead are never eaten. 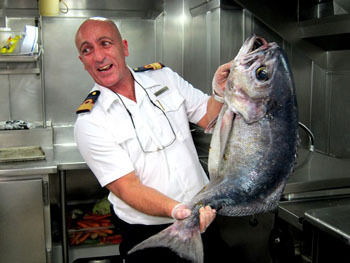 Erik also mentions that MV Edinburgh's Captain Clarence also reported a massive squid floating near the rookery with birds standing on it and eating it. He was unable to recover it as the water was too shallow to go in with the ship. Squid form the staple diet of many seabirds, with indigestible beaks being found in the pellets of albatrosses and petrels. They are not regarded as an inshore species, so this fishing expedition may be of interest to marine biologists and we will seek identification of the Cephalopoda species. 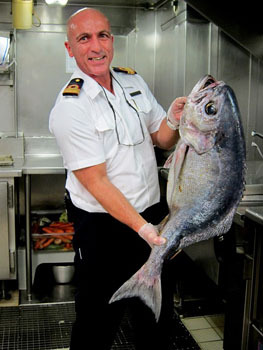 MV Edinburgh returned to Tristan on 3rd April and will catch the remainder of the Tristan da Cunha and outer island fish quota before returning to Cape Town later in April. So the 2014/15 fishing season, which started on 1st July 2014, continues longer than normal. off Nightingale Island on 23rd March 2015. MV Edinburgh to come in and assist once she lands her quota at the other three islands (Gough, Inaccessible and Nightingale). and brought live in tanks ready for processing. At the end of November, 5 months into the season, we have only landed 31% of the Tristan quota of 50 tonnes. The weather has played a big part in these disappointing results and we have only had 17 fishing days so far this season. 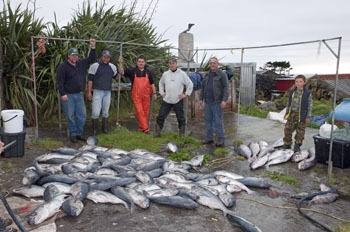 November is usually our peak month, but we had only 4 days and caught 11.3 tonnes. 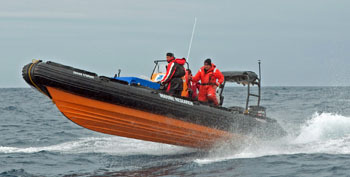 We are all hoping that it is a late season and that both the weather and landings improve soon. 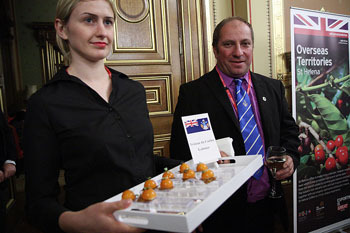 Sashimi) and we will work through all the feedback to see what we can realistically provide on an ongoing basis. It is very satisfying to see results at last from the hard work put in by a lot of people on Island and in Cape Town with very valued input from Ian Goulding consulting for us in Europe to enable exports to the EU to be made at last. for the very first time in the UK and the EU. to date this season. The weather has been a big factor with so far 5 fewer fishing days than last year and lower daily landings as well. It seems that the season could be slightly skewed with a lot of fish being seen that are still in berry and no significant presence of females yet. I am hopeful that as soon as the numbers of females increase we will see a corresponding increase in daily landings - as long as we start getting suitable weather. The smaller landings have been good for factory production however, as we are able to keep a higher proportion of live lobster for purging and further processing into whole raw, whole cooked and Sashimi. The water has also been cold and we are now using five of the live floating platforms on a daily basis between the boats so the lobster are alive and strong on arrival at the factory. Hopefully November will improve and I can give a more upbeat report at the end of this month. New Fishing Season gets underway and Total Allowable Catches (TAC) for the 2014/15 fishing season set. The fishing season which started on the 1st July produced two fishing days in July, landing 2.3 and 2.5 tonnes respectively, despite some minor problems with boats. 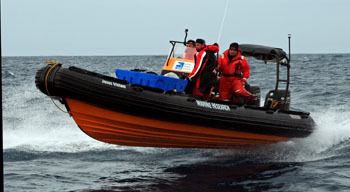 The Fishery Patrol boat Wave Dancer and Conservation RIB also took advantage of the good weather and visited the outer islands of Inaccessible and Nightingale on 18th July. which is a record in such a short space of time. 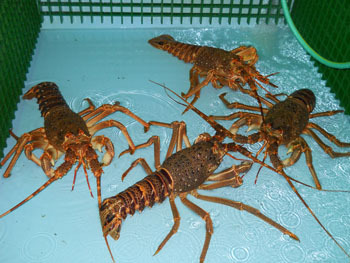 * pueruli are late larval-stage lobsters (singular puerulus) which are monitored at collecting stations around the islands as a measure to ensure a sustainable fishery. to clean his fish, as his Dad didn't need any help cleaning. Two views looking over Calshot Harbour on 18th July 2014 as boats go out for the first catches of the new season. 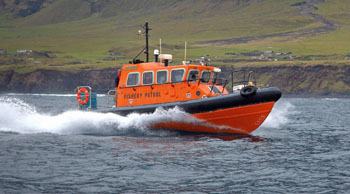 The season officially begins on 1st July but 18th was the first day with safe conditions for vessels to use the harbour.